The X-Men is a team of mutant super heroes formed by Profesor Charles Francis Xavier to fight for his dream of the peaceful co-existance of humans and mutants. 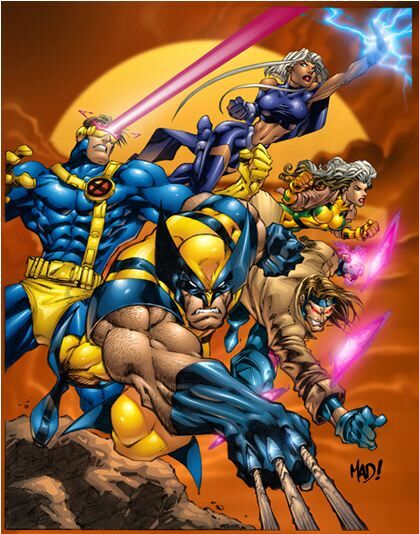 Originaly the X-Men was formed to train young mutants in the use of their powers but the team quickly changed into something else, a fighting force to defend humans and mutants from those who would harm them. These X-Men truly believed in their mentor's dream and carried it on through all sort of crisis' and even their mentors absence(which was several times). The roster has changed frequently but the dream still remained true. There is some debate about the X-Men still following the dream after the events of Onslaught and Zero Tolerance, but althouth the team is still getting over these events and has taken on a darker look the dream is still there. 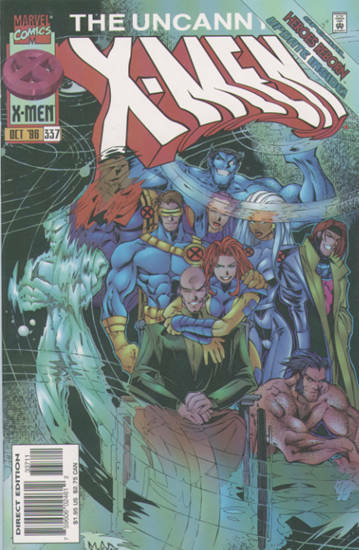 The current roster is: Storm, Wolverine, Iceman, Rogue, Joseph, Cannonball, and Beast. There are also the new comers Marrow, Maggot, and doctor Cecilia Reyes. Cyclops and Phoenix have taken a leave of absence from the team, Charles Xavier is still missing, Archangel and Psylocke are at Warren's apartament away from the team, and Bishop is in space with Deathbird. The other missing X-Man, Gambit, has recently been exiled from the team for his past crimes. That's pretty much the beat on the X-Men, I hope I haven't forgotten anyone. Further down the page you'll find links to the bios and pictures of some of my favorite X-Men. Pictures! : Pictures of cards, mostly some X-Men Timelines. Gallery: It's a small gallery of pic's I love. Back to X-Force Page: I love this team!